To order contact the OBA Administration Office. Our new 100% Ontario Honey baseball hat pairs well with the 100% Ontario Honey Apron. It is structured, and made of ultratouch deluxe heavyweight brushed cotton twill which will last several comfortable seasons. An antique silver ring buckle adjusts for a perfect fit. The OBA logo appears on the left side. "I am... 100% Ontario Honey" vendor apron. Great as a gift for a honey-lover or yourself, these aprons will appeal to both men and women – adjustable neck strap with two deep pockets. Stay hydrated in this stylish BPA free bottle. Size: 1" x 1" Size: 1" x 4 1/8"
To order contact Dominion & Grimm Inc.
How to cook and preserve with honey, and substituting sugar for honey in your recipes. Space available on back of brochure to apply your own contact information. Current members in good standing - shipping charge only. the hive? Why do bees make honey? What is pollen and what happens in pollination? What is Honey's Nutritional Profile? A Beeman's Journey is an exciting outdoors journey through the years in the footsteps of Naturalist-Historian-Beekeeper Charles Sauriol, author of Remembering the Don and Tales of the Don. The OBA currently offers a table top display available for use to current OBA members. Booking subject to availability. Photos and information on the colour panels can easily be removed and changed to customize for your promotional information. Please call the OBA Administration Office for availability. For enquiring minds of all ages visit our All about Honey website. 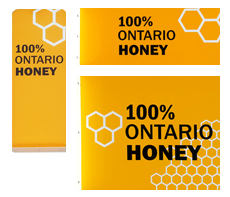 In addition to signage and clothing, an exciting product has been created by Canadian Honey Council (CHC) to assist in promoting "100% Ontario Honey. "Pierre the Bear" makes an appearance at your local event or fair. "Pierre" attracts the young and old with his sweet honey charm. "Pierre the Bear" is a custom costume available to OBA members. The costume is complete with a cooling fan for those warm summer events. "Pierre the Bear" is available for booking through the OBA office. Arrangements can be made to pick up at the OBA Administration Office located in Milton, ON. Ontario Beekeepers' Association gratefully acknowledges the financial support and guidance of the Ontario Ministry of Agriculture, Food and Rural Affairs in developing these promotional items.